I love me a bargain as you know. I like to try out different drugstore foundations because sometimes there are some really great ones out there on the market. 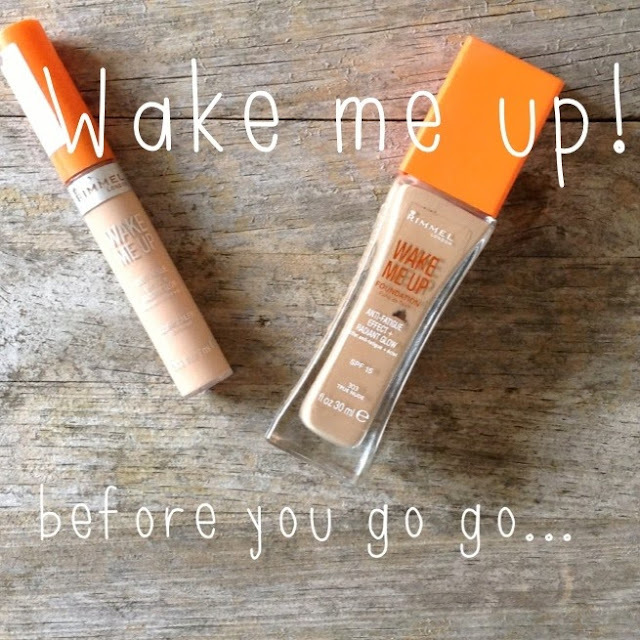 I heard a lot of people rave about the Rimmel wake me up foundation so I thought it was about time to give it a go. And at £7.99 or round about, it didn't break the bank too much. This foundation smells amazing, it is the perfect shade for me too. I struggle to find a foundation that has the right undertones for my skin, as I have a very pale face and neck but a relativley/slightly tanned body. *oh yeahhh* It blends in so well too! First up, the packaging. In a glass bottle it easily stands up in my ever growing makeup collection (that has now taken up a whole shelving unit and a ton of DIY storage!) What I also like about it is that is has a pump! Very hygenic, easy to use and limited mess. What more could you want? It is light to medium coverage, and is an all year rounder. In the summer it is not too heavy that you feel like you have a face full of makeup on, but gives great coverage and has a great longevity. In the winter, it can be built up for a more full coverage look, but doesnt feel heavy or cakey on your face. It has a dewy finish and leaves your skin looking radiant and youthful. It has a really nice scent too which I love to smell when I apply it. Typical for a Rimmel Foundation! As for the concealer, I like that the applicator is a stick with a sponge on the end. I think its called a doe foot applicator or something like that (don't hold me to it!) although its not the most hygenic of applicators, I don't think that really matters because I only apply this concealer under the eye where there probably is a lot less bacteria! This is a full coverage concealer in liquid form, and the applicator makes it so swift and easy to apply. I literally just sweep it from the inner corner out (as that helps prevent wrinkles and premature ageing!) following the under eye circle that kindly makes it home under my eyes. To blend it in I either use a real techniques contouring brush as it is light and feathery, or taky my ring finger and lightly dab it to blend in with my fingers. It has great coverage but still leaves your eyes looking bright, radiant, awake!, circle free and gorgeous! At around £4.99 it is a perfect match to the Wake me up foundation. Out of 10? a definite 10!